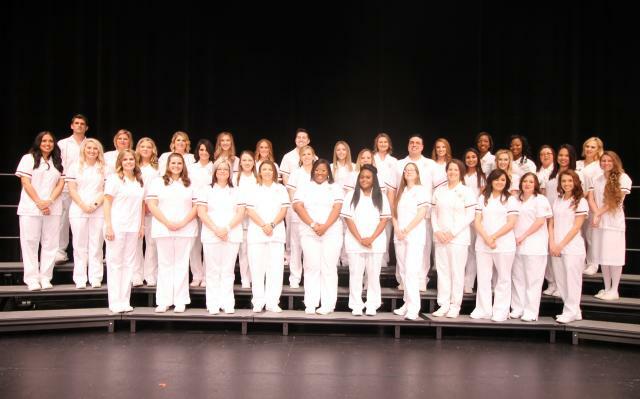 POPLARVILLE - Thirty eight associate degree nursing students at Pearl River Community College received pins and diplomas Monday, Dec. 11, in a ceremony at the Brownstone Center for the Arts. They are now eligible to take the licensure exam to be registered nurses. Eight of the graduates were inducted earlier in the day into the Beta Mu chapter of Alpha Delta Nu honor society. They are Katherine Ferguson of Poplarville, Jeffrey Marshall of Purvis, Lara McDonald of Hattiesburg, Danielle McGill of Lumberton, Victoria Powell of Picayune, Kimberly Travis of Petal, who earned a practical nursing degree from PRCC in 2012; Terri Kinler and Robert Schwab, both of Carriere. Dr. Arlene Jones, PRCC director of nursing education, presented awards and recognized graduates who are members of the Mississippi Organization for Students of ADN (MOSA). Autumn Votano of Picayune received the academic excellence award; Abbie Stringer of Foxworth, patient care award; Charmin Edwards of Hattiesburg, the PRCC Wildcat Nursing Award given to a student who persevered despite obstacles. 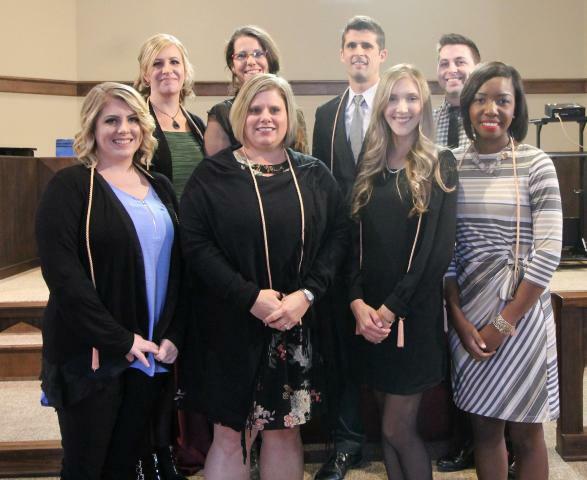 Receiving cords signifying their MOSA membership were Ferguson, Kinler, McDonald, McGill, Powell, Schwab, Travis, Marissa Baker of Poplarville, Seth LeBert of Hattiesburg, Megan LeDuff of Carriere and Jamie Lytwn of Slidell, La. Also graduating were Amy Archer, Morgan Glidewell, Laura Roche and Georgie Sessions, all of Carriere; Krystal Graham, Breanna Herndon, Jaren Johnson, Victoria Marisco and Megan Northrop, all of Poplarville; Ternisha Binion, Christie Lanier and Melanie Linton, all of Hattiesburg; Kasie Burr, Lisette Fayard, Jessica Gabrielle and Jessica Van Buren, all of Picayune; Diazha Dillon and Meagan Hutchinson, both of Foxworth; Leigha Keaton and Holly Thomas, both of Bogalusa, La., Melissa Bobbit of Kiln, Courtney Gerald of Columbia and Kaitlyn Wilson of Slidell, La. Associate degree nursing students inducted into the Beta Mu chapter of Alpha Delta Nu honor society at Pearl River Community College are, front from left, Danielle McGill of Lumberton, Lara McDonald of Hattiesburg, Victoria Powell of Picayune, Kimberly Travis of Petal; back, Terri Kinler of Carriere, Katherine Ferguson of Poplarville, Jeffrey Marshall of Purvis and Robert Schwab of Carriere. Pearl River Community College awarded pins and diplomas Monday, Dec. 11, to 38 students who completed the two-year associate degree in nursing program. They are, first row from left, Amy Archer of Carriere, Marissa Baker of Poplarville, Melissa Bobbitt of Kiln, Kasie Burr of Picayune, Daizha Dillon of Foxworth, Charmin Edwards of Hattiesburg, Lisette Fayard of Picayune, Katherine Ferguson of Poplarville, Jessica Gabrielle of Picayune, Courtney Gerald of Columbia, Morgan Glidewell of Carriere; second row, Krystal Graham and Breanna Herndon, both of Poplarville, Meagan Hutchinson of Foxworth, Jaren Johnson of Poplarville, Leigha Keaton of Bogalusa, La., Terri Kinler of Carriere, Christie Lanier and Seth Lebert of Hattiesburg, Megan LeDuff of Carriere, Melanie Linton of Hattiesburg, Jamie Lytwn of Slidell, La., Victoria Marisco of Poplarville; third row, Jeffrey Marshall of Purvis, Lara McDonald of Hattiesburg, Danielle McGill of Lumberton, Victoria Powell of Picayune, Laura Roche, Robert Schwab and Georgie Sessions, all of Carriere; Abbie Stringer of Foxworth, Holly Thomas of Bogalusa, La., Kimberly Travis of Petal, Jessica Van Buren and Autumn Votana, both of Picayune, and Kaitlyn Wilson of Slidell, La. Not pictured are Ternisha Binion of Hattiesburg and Megan Northrup of Poplarville.